Tablets with high resolution might become a new trend for all the devices. Following the release of the new Apple iPad with a high resolution of about 2048x1536 pixels in its 9.7inch screen, most of the tablets manufacturers are rumored to be busy in producing in devices of high resolution. Acer seems to have prepared their model of high resolution screen, and it is called the Acer Iconia Tab A700. 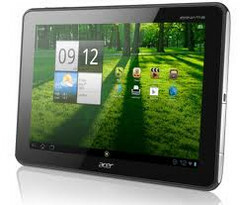 It can also be called as the updated version of the Acer Iconia Tab A500. Along with the updated screen this new tablet has some other enhanced specifications too. This A700 Tab is a 10.1inch model which has a screen which will be providing a resolution up to 1920x1200 pixels. Now you can say that it’s not as high as iPad but still this resolution is very impressive as most 15inch laptops still have a resolution of 1366x768 pixels. This device will be powered by Ice Cream Sandwich. Apart from the screen other specifications included with the device are 1.3GHz Nvidia Tegra 3 quad-core processor, a 1GB of DDR 2 RAM and a 32GB of storage space. It also sports two cameras one of 5megapixels while the other is 1megapixel. It has an 802.11n Wi-Fi for connectivity and even supports Bluetooth and GPS. It has an HDMI output port and a headphone jack too. They will be coming in black and silver colored casings. Both these variants will be priced at $449.99. This device weighs only about 1.47lbs.